This patch of land has came a long way. Barely 2 years ago, there were cranes all over it. I remember the first time I shot here, Marina Bay Sands was not even ready and I had to DI cranes after cranes away after taking the photos. And back in our younger years, Superbowl, Canto, korean BBQ are the residents of Marina south. Four years ago, I remember having my last bowl of curry chicken before everything got torn down. The roads are still the same, so I still can remember where the landmarks were. The night city skyline under a clear sky. Yesterday, I managed to sell one of my extra lenses. The person who bought it from me reminded me about how I used to love taking landscape pictures. That short 10 minutes talk with him made me realized how much photography I’ve missed ever since I made it my full time job. I used to travel to the most ulu places in Singapore in search for the most un-Singapore like places and wait for sunset. That hadn’t happen for a very long time. Besides weddings, travel and dive trips, my camera sits comfortably inside my dry box. I spend more time behind the computer than I spend behind the lens. This unhealthy habit has to change. And I hope this will be the first step of change. I don’t have to look far to find what I want. The Singapore skyline from The Marina Barrage. Black Friday in the states is just a day away and I found some interesting deals. One of which is the Mint floor cleaner that I bought earlier this year. 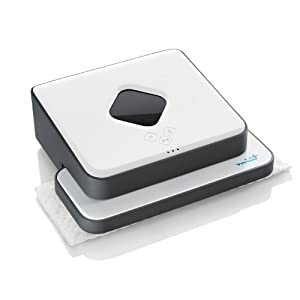 I got the idea on getting a robotic cleaner for my home/office when I saw someone trying out a Samsung Navibot at while doing my usual electronics window shopping. Right after that I did some research on different types of robotic cleaners and found the Mint Cleaner. For more info, you can read more on their website. I will just write on my personal experience with this little machine. This little robot is probably one of the smallest robotic cleaner on the market. This is because of it’s lack of vacuum unit. Instead, it uses a microfiber cloth (or disposable paper towels) to pick up dust and hair and does a fantastic job doing it. This makes the unit extremely quiet compared to the vacuum based cleaners. The downside is you will have to change the microfiber cloth or disposable towels (eg. magic clean or similar) once it gets dirty. The lack of vacuum unit also means it cannot clean carpets. As for wet cleaning, it does an okay job. Due to the weight (or lack of it), it can’t do any deep cleaning. It will remove light stains and get rid of the sticky feeling on the floor, but not major spills or hard to remove stains. The robot navigates by reading signals from a small external navigation unit. This unit bounces signals off the ceiling and “tells” the robot where to go. It navigates in a rather systematic way, going up and down the room like a minesweeper. Towards the end, it will do a perimeter sweep on the entire area which it just cleaned. For those with many rooms might want to experiment on the placement of the navigation unit to get the best position. It also get around corners and furnitures pretty well (it’s also easy on the feet :P). I use them almost daily after I bought it in Feb and had not vacuum my floor since. Now the floor feels clean every single day. Before you think about getting it, think if it’s suitable for your lifestyle. If you can afford 2 mins everyday to set this thing up to run and not have alot of carpeted areas in your house, this is probably something that will make your feet happy. And for those who work from home or have pets, that’s even better because it’s really quiet since it doesn’t vacuum. In summary, whatever your Magiclean can do, this cleaner can do it for your automatically. Personally, I rate this as my best gadget buy this year:) Because it’s perfect for me and it’s fully utilized:D Beyond that, it’s like my electronic pet. Btw, I’m not in any way affiliated to this company, just thought I’d share some experiences since quite a number of people are asking me about them. Check out their website at www.mintcleaner.com. Also check out the newer model, which has longer battery life and better wet cleaning capabilities. You can also read other users reviews on amazon.com. To buy from Amazon, you can use vpost, borderlinx, comgateway, etc to ship them over since Amazon only ship them in USA. No power conversions required. I think there’s a pretty good black friday deal now on their website.